They are places we've come to take for granted, iconic and stunning symbols of freedom, history, progress or nature's magnificence. Generations of tourists have visited and marveled at their beauty, grandeur or sheer accomplishment. 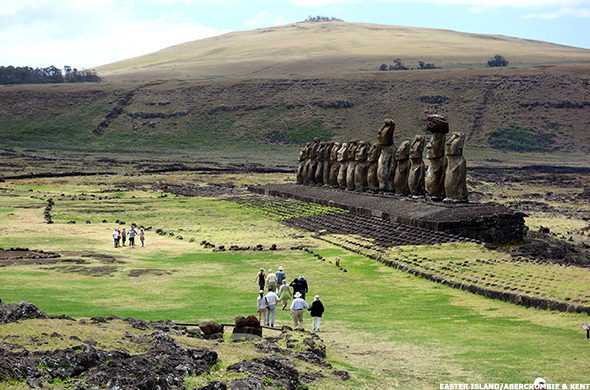 But unless action is taken quickly, countless World Heritage sites, including such famed places as the Statue of Liberty, Stonehenge, and the Moai statues of Easter Island, will not be around for future generations. A recently released report, entitled World Heritage and Tourism in a Changing Climate, paints a frightening picture for the future of many of the world's most treasured tourist destinations. Produced by UNESCO's World Heritage Centre, the United Nations Environment Programme (UNEP) and the Union of Concerned Scientists, in close collaboration with the International Union for the Conservation of Nature (IUCN), the report details the devastating current and potential future impacts of global warming on iconic sites around the globe. "Climate change is fast becoming one of the most significant risks for World Heritage sites worldwide," according to the report. "Unequivocal scientific evidence shows that concentrations of the main greenhouse gas, carbon dioxide, in the atmosphere are greater now than at any time in the past 800,000 years and that global temperatures have increased by 1 degree Celsius since 1880." Rising temperatures translates into worsening heat waves, more extreme and more frequent precipitation events, and warming oceans that are acidifying. And those are just a few of the impacts of global warming. All of which means thousands of historic buildings, locations, parks and monuments are vulnerable. "We are living in a very dangerous time in terms of climate change," says Peter DeBrine, senior project officer for the Sustainable Tourism Programme at UNESCO's World Heritage Centre in France. "What we're seeing today is unprecedented, 2016 has been the hottest year on record. In Asia there has been severe droughts and now they're having horrific monsoons. And that's just one example...We're seeing all of these firsts around the world and all of these records being broken." 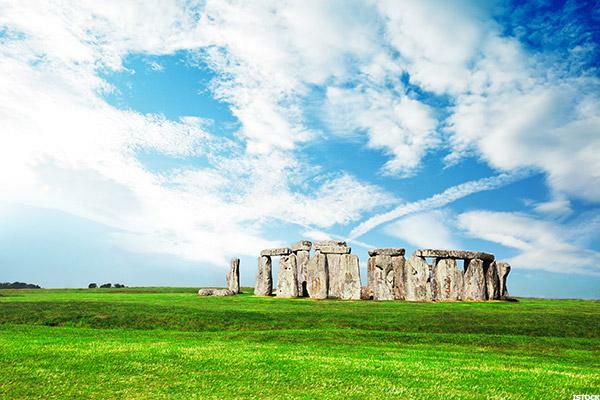 There are currently 1,000 World Heritage properties spread across 163 countries. The report provides detailed case studies for 31 of those sites. 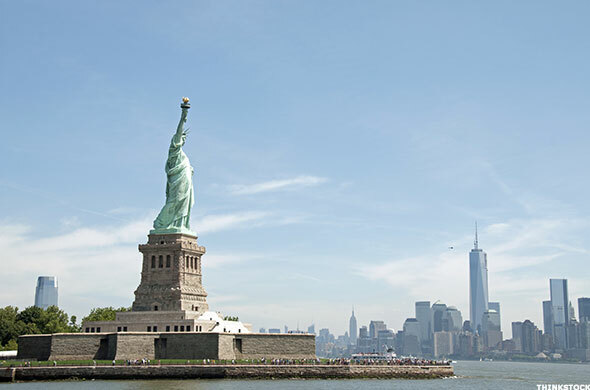 In the United States, the famous tourist destinations at risk include Yellowstone National Park, Mesa Verde National Park and the Statute of Liberty, one of New York City's most legendary stops. Designed to seem invulnerable, the statue, which has welcomed countless waves of immigrants and tourists, is actually at considerable risk. Among the biggest threats is sea-level rise and increasingly intense storms and storm surges. Sea levels along the Atlantic coast, from North Carolina to Maine, and including New York, have been rising at four times the rate of the rest of the U.S. coast during the last 20 years, the report points out. "100% of the assets at Liberty National Monument are at high exposure risk from sea-level rise due to the extremely low elevation of the island and its vulnerability to storms," says the report. A foreshadowing of the potential damage the statue could suffer thanks to Mother Nature came in the form of 2012's Hurricane Sandy. Flood waters from Sandy inundated 75% of Liberty Island, causing extensive damage to infrastructure and facilities. Combined with Ellis Island, the cost of repairs was more than $77 million. "In terms of seeing impacts, we're seeing them today," says DeBrine. "What happened with Hurricane Sandy and how badly it impacted the Statue of Liberty is a good example of what's already happening today. The impacts of global warming are happening a lot sooner then we thought. Global temperatures are rising faster then we thought and there's a lot of uncertainty. The big message is we've got to get emissions down." Scientists also have major concerns about Yellowstone National Park. Temperatures in the Rocky Mountain states, where Yellowstone sits, have risen by 1.17 degrees Celsius since 1895, with the greatest changes recorded in the last few decades. That has meant shorter winters, less snowfall, and decreased duration of snow on the ground at Yellowstone. The amount of snow in the park and the timing of snow melt, in turn, affects Yellowstone's rivers and streams. Smaller amounts of snow and runoff combined with higher summer temperatures are warming the water in Yellowstone's rivers and decreasing the amount of water in them. That may seem harmless to some, but the warmer temperatures are impacting such things as the native cutthroat trout, causing a 26% decrease in the population. The lakes and wetlands of Yellowstone are also shrinking in some parts of the park. 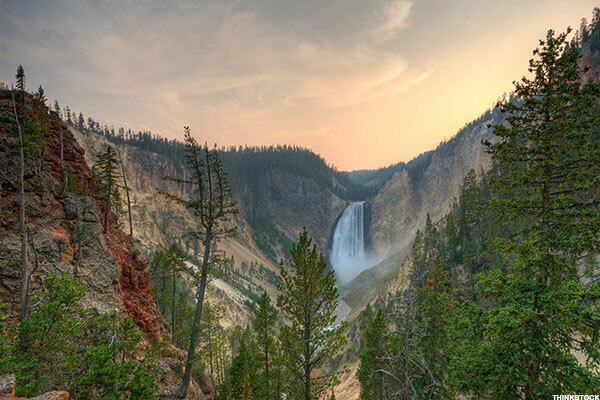 Scientists estimate that 40% of the wetlands in the Yellowstone Ecosystem could be lost. Globally, the city of Venice and its extraordinary assemblage of of Byzantine, gothic, renaissance and baroque architecture is perhaps the best poster child for the impacts of climate change and sea level rise. 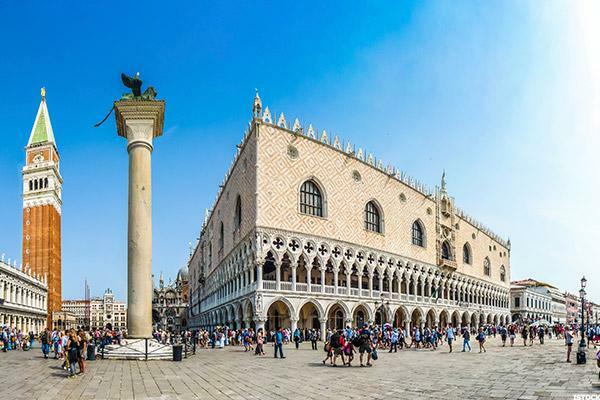 Hundreds of buildings in the ancient city have already been damaged by floodwaters and walking through famed St. Mark's Square regularly requires wearing waders up to your knees. "In Venice the risk is very acute," says DeBrine. "Venice has invested a huge amount of money in a barrier to protect it from tidal surges but even the measures they're putting in place may not be enough. And you have the geology of the lagoon, you can't completely cut it off. That would be an environmental disaster." The report also points out that more than half of the world's reefs are at risk due to climate change, a fact that's not likely to change no matter what we do. Even under the most ambitious scenarios for reduction of global greenhouse gas emissions, 70% of corals worldwide are projected to suffer from long-term degradation by 2030. And it's not just the tourist sites themselves that are in danger, the surrounding economies and communities that have grown to depend on these iconic destinations and attractions, are also threatened by their demise, according to the report. "Every day that we're not treating this as the global emergency that it is, with proper urgency, is a day wasted," says Betsy Rosenberg, who for years hosted an environmental radio talk show on KCBS and Air America, before starting her own shows EcoTalk and On the Green Front. "The impacts have already arrived on our shores - tornados, cyclones, flooding, fires and droughts. We're seeing record this, record that, all of which is the handprint of climate chaos." Rosenberg, an award-winning broadcast journalist with more than two decades of experience, has just developed a pilot environmental news show and says she's grown increasingly frustrated and dismayed over the media's lack of attention to this important issue. Networks such as CNN are largely ignoring the environment, Rosenberg points out. "We're letting the media off the hook by not forcing them to do something," she continues. "Every major and minor ecosystem show signs of decline. It's a wholesale change going on, that has so many effects on our oceans, forests, crops, and water. It's astonishing that we're not going code red. We're world class deniers in the U.S. and that's going to cost our kids and our grandkids." Marty Essen, the award-winning author of two books, including the new book Endangered Edens: Exploring the Arctic National Wildlife Refuge, Costa Rica, the Everglades, and Puerto Rico, has traveled to seven continents in the process writing his books, and come away with similar concerns about the state of the planet. "I see damage done by global warming wherever I go," he says. "It's very shocking. That's why I write my books, to build awareness. This is not a hoax." The UNESCO report does look to the future with some optimism and guidance. In particular, the report places hope in the adoption on the world stage of two documents - the United Nations General Assembly's Transforming Our World: The 2030 Agenda for Sustainable Development and also the historic Paris Agreement on climate change. The 2030 Agenda for Sustainable Development, and the associated Sustainable Development Goals (SDGs) adopted by the UNGA, calls for strengthening efforts to protect and safeguard the world's cultural and natural heritage, with a laundry list of specific, measurable actions. The Paris Agreement for the first time represents a global consensus on capping global warming. "Together, these two international accords provide a new framework to guide governments in responding to climate change and steer them towards sustainable development. If implemented, they can support an enabling framework to protect World Heritage and tourism destinations for future generations," states the report. But that's a big if in the previous sentence, and history has shown that there are plenty of skeptics, roadblocks and delays when it comes to global warming and taking action. "First and foremost, if I had a bucket list of sites I wanted to see, which I was saving for the end of my life, I would carve out time to visit these places now, sooner, rather then later," she says. In addition, Ekwurzel says there are small actions people can start incorporating into their daily lives to help fight this monumental battle, simple things like washing clothes with cold water rather then hot, which results in five times less CO2 emissions. For those who own a car, make sure the next time you purchase a vehicle, it is the most fuel efficient car for your size needs. You can also vote with your dollar, supporting companies that have made a clear commitment to sustainable, environmentally friendly, daily practices, including companies within the tourism industry - such as cruise ships that have recycling programs and more. "We are on a pathway - we can't change what's going to happen between now and 2030 because we've inherited those impacts from our parents and grandparents. But after 2030 that's when the scenarios start diverging," says Ekwurzel. "So what we do between now and 2030 will determine whether -- after that date -- we will have a reasonable scenario that we can live with and that will save a lot of these sites, or a much scarier path."